Mozilla released a list of the top ten Firefox extensions that slow down the browser’s startup time. 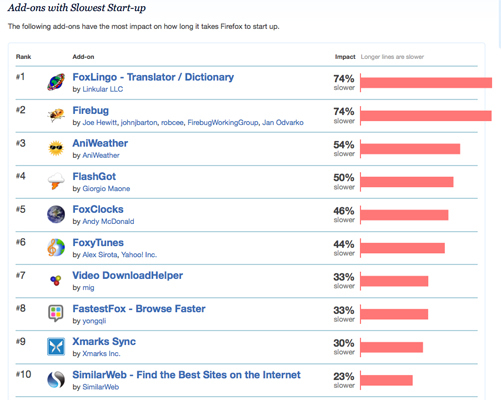 The worst offender, decreasing Firefox startup time by an immense 74%, was FoxLingo. Mozilla has likely taken this step to ensure that its browser remains speedy even with the inclusion of extensions in the hope of staying competitive. With browser performance being a big issue even for Microsoft these days, Mozilla hopes to encourage developers to optimize their extensions so that they don’t affect browser performance too much. The organization has further plans in that regard, such as automated performance tests on the 100 most downloaded extensions as well as warning users who are about to download an add-on that will decrease performance by more than 25%. To view a list of the top 50 extensions that cause a slow startup, click here. Does anybody else notice the irony of extension number eight being in the list? since i load the browser only 1 time in a day , (less in a laptop because sleep/hiibernation) ill happily have a browser that takes more to load and then is faster at browsing.